A furry success story in the making? Sea Otters were thought to be extinct in California until a small population was found off the coast of Big Sur in 1938. However, despite years of federal and state protection, their numbers have only recovered to a fraction of what they once were. Predictors of ocean health! New research aims to shed light on this slow population recovery and recent increase in sea otter deaths. Sea otters are considered a sentinel species and researchers can learn a lot about the health of our ocean from investigating this species. Unlike other marine mammals, sea otters lack blubber. They keep warm from the chilly surrounding water with a high metabolism, dense fur, and by having an insulating layer of air between their skin and the water. A full head of hair! They were hunted to near extinction for their fur, which can have 1 million hairs per square inch. For comparison, the average human has 100,000 hairs on their entire head, no wonder we have to keep our heads warm with hats in chilly weather! Champion Eaters! Sea otters have to eat about 25% of their body weight in food every day to maintain their high metabolism. For example, a 60-pound otter has to eat about 15 pounds of food every day! 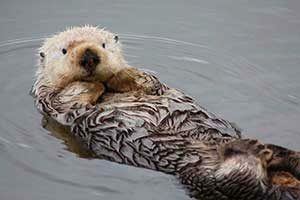 Sea otters play an important role in kelp forest ecosystems. They are considered a ‘keystone predator’ because their presence/absence can greatly alter these habitats. Sea otters feed on urchins in kelp forests, but when sea otters are absent urchins are able to graze down kelp forests, sometimes leaving them barren and lacking life.